What’s Different About Adult Acne? Acne isn’t just a problem for teenagers. Many adults also have acne. 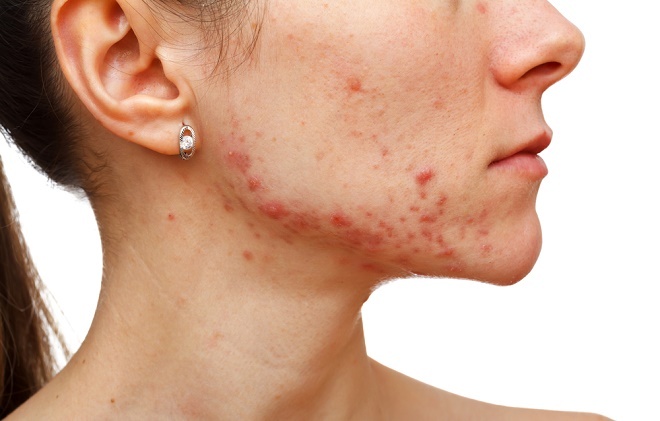 Around 80% of adult acne cases affect women, thought to be because of changing hormone levels during periods, pregnancy, medical conditions such as PCOS, or as a side effect of medication. Acne develops when dead skin cells and natural oils (sebum) block up tiny hair follicles in the skin. Bacteria work their way into the plugged-up follicles and start multiplying. When the body’s immune cells move in to attack the bacteria, the results of the battle are the classic symptoms of acne – swelling, redness and spots. Adult acne differs markedly from the spots of your teenage years, both in how it appears and how it’s treated. In teenagers, you’ll mostly see lots of tiny bumps, blackheads or whiteheads on the skin of the face, especially the forehead, along with occasional cysts on the chest and back. That’s because teens’ skin tends to be a little stickier and they’re more likely than adults to get clogged pores. In adults, acne is more likely to appear on the lower part of the face, especially around the mouth and jawline. It’s usually deeper nodules or red papules in those areas. The fine little bumps of teen acne can still happen in adulthood, but it’s much less common. Some adults continue to get acne well into their 30s, 40s, and even 50s. It is even possible to get acne for the first time as an adult. Dermatologists call this “adult-onset acne.” It is most common among women going through menopause. Fluctuating hormone levels can lead to breakouts. In my personal experience, stress has been the largest factor in my adult acne flare-ups. Acne medications help by interrupting this process in different ways. Some over-the-counter and prescription acne creams help by unplugging the follicles. Others – such as antibiotics – kill the bacteria that move into the follicles and reduce inflammation. Oral retinoids such as isotretinoin work differently by reducing the amount of oil secreted by glands in the skin. There is no single best acne or spot treatment. Some people do well using one acne cream, while others need a combination of approaches to control their acne. Most of the over-the-counter products involve salicylic acid and/or benzoyl peroxide. Benzoyl peroxide is non-prescription drug that works to destroy acne-causing bacteria in your pores. Also known as BPO, it works primarily as an exfoliating agent by increasing the turnover of the skin and removes the mixture of sebum and dead skin cells from the pores. There are many BPO product options available to consumers. Not only are there numerous brands, but it also comes in a variety of concentrations. Benzoyl peroxide is a powerful ingredient that is effective against all kinds of acne lesions (blackheads, whiteheads, and big, red, cystic pimples). It is bactericidal, meaning it kills bacteria, rather than simply slowing down their growth. Benzyol peroxide acne treatments can also work very quickly, improving acne as early as five days after starting treatment. It’s a great first line treatment for acne, but it’s also helpful to use in combination with antibiotics. In fact, benzoyl peroxide has the ability to prevent antibiotic resistance. One thing to watch out for with benzoyl peroxide is that it can bleach dark fabrics. It can also cause drying, peeling, and redness if it’s not delivered in the right amount, surrounded by the right mix of ingredients. It may take some experimentation to see what concentration or frequency of use your skin tolerates best. Benzoyl peroxide works quickly (as soon as five days!). As an added bonus, benzoyl peroxide prevents antibiotic resistance. It can cause dryness, peeling and redness. In some cases, benzoyl peroxide can cause post-inflammatory hyperpigmentation (a.k.a. dark spots). Note – I’m a staunch believer of the fact that there’s no quick acne treatment, and studies have proven this. So if you’re thinking that a benzoyl peroxide based product can cure your acne overnight, I’m afraid you’ll be disappointed. You’ll have to be patient and let the product work for at least 2-3 weeks. It can be very effective at clearing up adult acne, but it takes a little time. CleaRx, Differin (uses retinoid), Proactiv, and Murad all have excellent reputations and high quality product lines. Any one of these can work well on adult acne. As a personal recommendation, I like CleaRx products. They have worked really well for clearing up my adult acne (even the cystic bumps on my jaw – which are a nightmare). CleaRx contains the maximum OTC (over-the-counter) strength 10% benzoyl peroxide along with other acne fighting ingredients, so Give CleaRx a chance on your toughest acne before you see a dermatologist. I also find them to be the cosmetically elegant (spa-like), and pleasant to use, which, while not as important as effectiveness, also matters to me. For me, CleaRx and stress management are the best ways to manage my adult acne. I feel like CleaRx really helps bring my skin back in balance, and helps me to keep my flare-ups to an absolute minimum. Try non-prescription products as your first line of defense, but if you’re having no luck with them, talk to your dermatologist about prescription treatments. Your doctor may recommend one treatment, or suggest combining a cream with an oral medication. Prescription creams containing retinoids (derived from vitamin A) to help unplug follicles. Combination creams that combine the cleansing agent benzoyl peroxide and antibiotics such as clindamycin. Oral contraceptives, which can regulate the hormonal fluctuations that spark breakouts. Oral antibiotics, which also act as anti-inflammatories. Adult acne is different from teen acne, but it can be cleared up and managed. Be aware of your stress level, and watch for products you use which might aggravate your skin and clog pores. Purchase a high quality acne system and stick with it, adjusting as needed for formula strength and/or frequency of use. If you don’t have a satisfactory result from an over the counter system, consult with a dermatologist. And don’t panic – there are many options available. I hope this article provided you some practical information about clearing up and managing adult acne. Which Scar Treatment Works Best? Does Biosil Actually Do Anything? Blue Emu and Australian Dream – Which One is Better? Is the MyPurMist Inhaler Worth Buying? Which Scar Treatment Product Works Best?